A showcase of today's hottest must-haves and fashion advice from our stylists. Stripes have played a part in our wardrobes for ages. 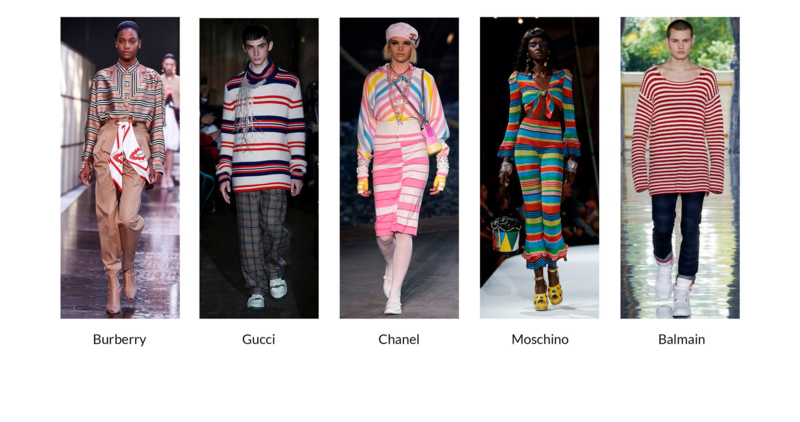 A sign of the devil in the Middle Ages, a mark of the aristocracy in the 16th century, an emblem of revolution in the 17th century, and an ambassador on fashion’s foremost runways, stripes have had a remarkable history. One type of stripe you can't ignore is the famous sailor stripe. A classic pattern in both men's and women's closets, it got its start on sailor's uniforms. 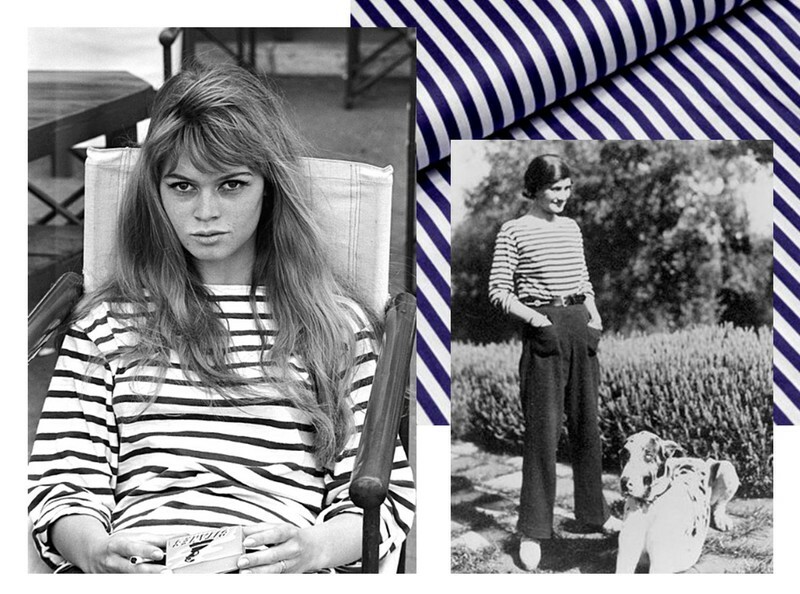 While navigating open ocean, this stripe (also known as the Breton stripe) inspired the fashion and luxury industry largely thanks to Coco Chanel. It was the main inspiration behind her nautical collection designed at the end of the 1910s. 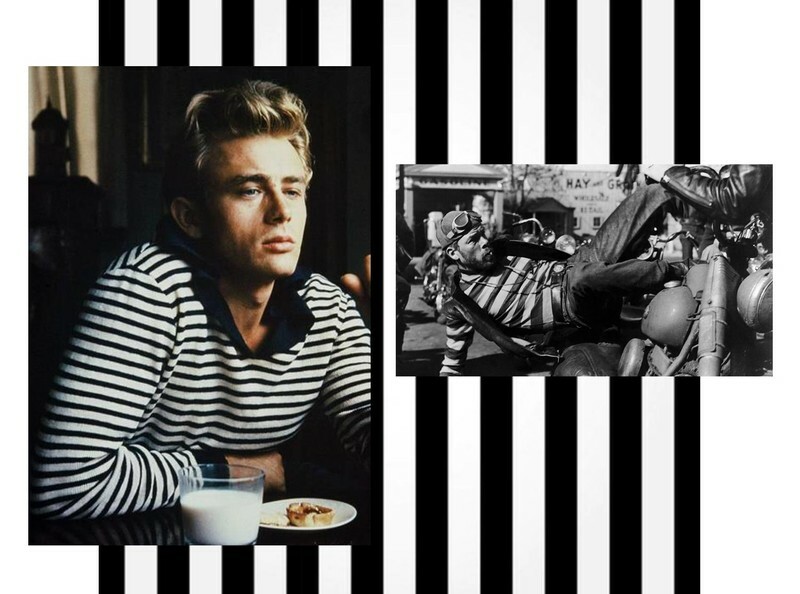 Popularized on the big screen in the 1950s by Marlon Brando and James Dean, the sailor stripe took on a rebellious edge, replacing the navy blue stripes with black. Afterward, numerous artists like Pablo Picasso and Andy Warhol took to this trend. 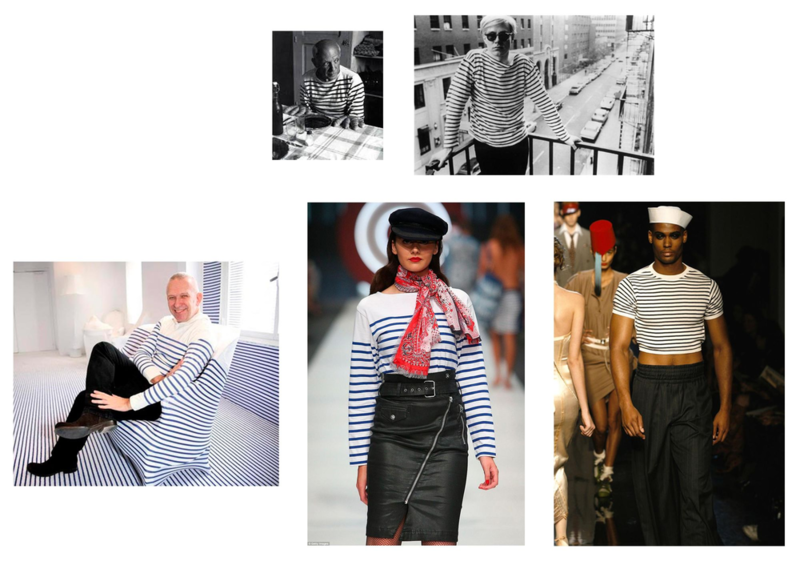 A few decades later, stripes would be brought back to the centre of the fashion world by Jean-Paul Gaultier. Using sailor stripes in his collections for men and women, he experimented with different ways to present the pattern. Stripes were an integral part of his designs. It was even the principal element of his iconic Toy Boy collection that hit the runway in the early 1980s. Since then, many of fashion’s top names have been inspired by stripes, like Paul Smith, who designs using many multicoloured stripes, and Missoni, who displays them in zigzag patterns. This spring at Simons, stripes are drawing some spontaneous lines. Extra colourful, outlined, in different proportions, and placed either vertically or horizontally, stripes are simply dazzling. They’re breaking the rules, blending together, and redefining themselves on T-shirts and shirts for men (on fluid camp shirts in particular). Top brands like Guess, Tommy Jeans, Levi’s, and Calvin Klein Jeans are all signing up for stripes. There’s also something new we’ve spotted this season: striped trim that lines the leg. This is a detail that’s trending in tailoring as much as in casual menswear. Again inspired by the world of sailing, it adds a distinctive and modern touch to any outfit. Defined and redefined for decades, the stripe is once again making its mark this season! With the winter weather waning, we're ready to wave goodbye to our heavy coats and say hello to all the bold brights and pale pastels that signal summer is on its way. This new season is giving us infinite options on how to pair shades from all across the spectrum and make a major mood-lifting style statement. The two-piece business suit has come back stronger than ever before for the new season. We'll show you four ways to reinvent this look based on the top runway trends. This spring, the Simons team invites you to discover the colour palettes that caught the eye of today's top designers and have painted the pieces of our menswear collections. This spring, the Simons team invites you to discover the colour palettes that caught the eye of today's top designers and have painted the pieces of our private labels. 2019 highlights the 100th anniversary of the famous Bauhaus school that gave birth to the art movement of the same name. Beautiful, bright sunshine, the soothing sound of waves crashing against the shore, and the feel of hot sand against your skin fills your daydreams. Living Coral represents modern life's fusion with our natural environment, since the colour appears as much in our natural surroundings as in our digital world. Our latest Fall/Winter 2018 men's collections lookbook offers a glimpse into fashion that is rich and colourful, yet unabashedly refined. Brightly hued trompe-l'oeil drapes cozy up to chic black and white tiles, patterned wallpapers, stripes and mosaics coexist in a unique harmony to become a trove of carefully selected retro décor elements. Are you out of breath yet? Do you always feel like you are running around? Do weeks, months, and years go by so fast that you don't notice them flying by? Let's slow down, shall we? Let's talk about slow. This pattern is no ordinary plaid and is taking hold of everything fashion has to offer this fall/winter 2018-19. Known worldwide for designs with innovative motifs and a bold use of colour, Marimekko doesn't fit in with the popular trend of Scandinavian minimalism. In fact, the design house's aesthetic is quite the opposite. Summer is in full swing. The sun is shining and we're enjoying every minute of the warm weather, but in the wonderful world of fashion, it's been fall for a few months now! To get a jump on the hottest style elements for next season, there's nothing better than taking a quick look at the runways of the biggest designer labels. At Simons, we've got you covered with our list major must-haves for the semester that'll earn you the superlative of “Best Dressed” even before the first bell rings. Over the years, the idea of two people wearing the same outfit has become a bit of a fashion phenomenon. In fact, it's grown increasingly popular on social media and blogs, and has been spotted at fashion weeks in major cities. Temperatures are on the rise and so is our excitement for summer. We're thinking more and more about vacations in the sun and the soothing ocean air. Flowers are blooming. The air is getting warmer. Soft, fluid fabrics, pastel hues, and floral patterns are about to invade your wardrobe. Prints are powerful drivers of style and what's in changes from season to season. The right print can transform a classic outfit into a real fashion statement. Every print tells a rich story of the cultures and trends that inspired it. This spring, the Simons editorial team is bringing you a selection of their favourite fabrics. Make way for gingham, stripes, floral, and camouflage! The Land of the Rising Sun invites you on a luxurious journey down its cherry-blossomed boulevards where sophisticated minimalism meets delicate femininity. While a new Transformers film hit theatres this past summer, another type of transformer—one for your wardrobe—hit the runway and the street. Say hello to the Trans/Form trend, a style direction that's resizing and redesigning basics, creating sartorial staples in fresh proportions. Think longline pieces, boxy tees, wide legs, drop-shoulders, and minimalist mock necks with dimensions that are dramatically different from what's already hanging in your closet. Soft, rich, and sophisticated, velvet is this season's style star… and it comes as no surprise that it's now our #1 crush! Ladies, say hello to the new version of velvet! Welcome to the capital of Japan, a city that's always on the move, buzzes with energy, and surprises you with something new all the time. How do you build a well-balanced wardrobe? Learn what the clothing categories are and their appropriate ratios so you can build a fully functional men's wardrobe. Read our travel guide to get ready for a stylish and carefree getaway. Many people like to go straight from the gym or yoga studio to their regular activities without changing out of their workout clothes as it allows them to save time, all while remaining stylish, practical, and comfortable. The Orlebar Brown collection: not your average swim shorts! Soak up the sun with the new swim shorts collection for men that combines luxury and comfort! Discover this movement that combines street style and the cutting-edge creativity of today's top designers. The buzz around athleisure has reached a fever pitch. In light of its practical appeal—a trend combining athletic and leisure apparel that transitions seamlessly from gym to post-workout plans—it's not hard to see why. From a whisper to a roar, a unisex movement has been sweeping through the global fashion scene. We're welcoming it to our doors with the premiere of Unisex Edition for the 2016/2017 fall/winter season. Make way for summer dresses! Summer is upon us and the warmer weather has us over the moon. What better way to soak it all in than by dressing up in sheer, feminine dresses? Vans is turning 50 years young! Founded in 1966, the California-based company has quickly become a household name in fashion with shoes that marry durability, elegance and comfort. This latest boho-inspired trend is a natural choice whether you're in the country side or in the city.